This online prank will destroy your Xbox One console. Do not attempt. FAKE instructions showing Xbox One owners how to "hack" their console to play old Xbox 360 games has been leaving consoles bricked and completely useless. Daily Dot has reportedthat website 4chan, which also conned soppy iPhone owners earlier this year into thinking the new iOS will make their mobiles waterproof, has returned to wreak havoc among the unsuspecting public this time by posting a way to unlock backwards compatibility to play old games. The instructions carry Xbox branding and look quite genuine but DO NOT be fooled. 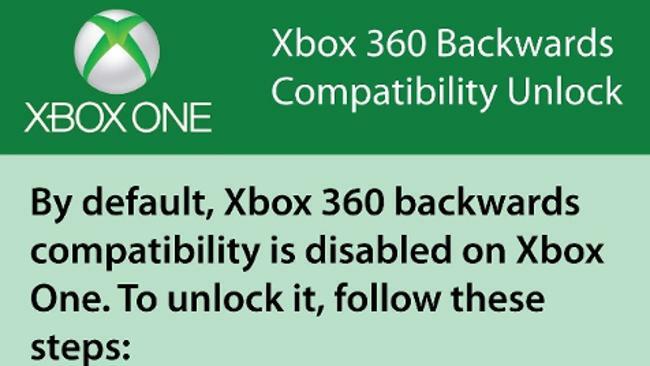 This is an evil prank that causes Xbox One consoles to "brick" rendering them utterly useless. And there are no instructions to fix it. Why would anyone believe anything posted on 4chan? The same ones that thought iOS7 made their iPhones waterproof. FestiVal wrote: Why would anyone believe anything posted on 4chan? The thing is I don't think people are getting this direct from 4chan (at least, I hope not) They're probably posting this on other sites, and it's been traced back to 4chan. I guess most people got this pic from 4chan, but I believe it's been on other sites. Pfff more Microsoft propaganda, trying to prevent you from unlocking your backwards compatibility. Don't listen to 'em, lads, unlock those Xbones. You guys...guys....if you delete SYSTEM32 on your computer your computer will run faster. It was a ploy by Microsoft to infect everyone with SYSTEM32 so you could be monitored. This monitoring is also what is causing the slowdown. If you delete SYSTEM32 from your computer right now, you'll see an increase in FPS for your video games and next to no loading times everywhere else! DO IT! The night AI went crazy wrote: Pfff more Microsoft propaganda, trying to prevent you from unlocking your backwards compatibility. Don't listen to 'em, lads, unlock those Xbones. I'm glad I listened to this, and found out what to do. Now playing fable through by Xbone! I dunno how they've done it, but they're able to improve the graphics on older games.....it's beautiful!! Candy Cane wrote: You guys...guys....if you delete SYSTEM32 on your computer your computer will run faster. It was a ploy by Microsoft to infect everyone with SYSTEM32 so you could be monitored. This monitoring is also what is causing the slowdown. If you delete SYSTEM32 from your computer right now, you'll see an increase in FPS for your video games and next to no loading times everywhere else! DO IT!